What Would That Do To Your Profits? and website 1st in the search engines and first in the minds of buyers in your market place. Discover precisely who your ideal customer is and what they are looking for to help bring in buyers and not tyre kickers to your business. The 3 most important aspects of any website. 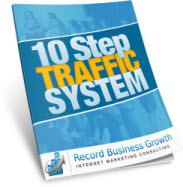 Without this your conversion rates will be crushed. How to use Google to quickly get front page listings and get your story in front of thousands of people. Leverage the 3rd most popular site in the world whilst creating attention towards your business on the front page of Google. and how you can zero in on your market for a fraction of the cost of regular advertising. How to broadcast your message for free and position yourself as a market leader. The 6 key questions you must ask your SEO Consultant before engaging their services in 2011. Call Nick on 0410 066 868 to discuss your SEO and internet marketing needs. If you prefer you can contact us here. We take your privacy seriously. Your information is never shared or sold for any reason.